As part of their commitment to triathlon's long-term legacy Olympic champion Alistair Brownlee and bronze medallist Jonny Brownlee launched the 'Brownlee Foundation' following their successes at London 2012. The programme sees thousands of school children given the opportunity to try out a mini-triathlon experience - with the hope that it will inspire them to take up some form of physical activity. 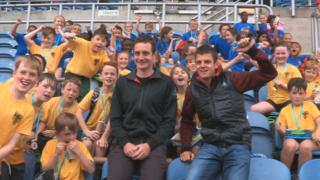 BBC Sport's Nick Hope followed school children from around Yorkshire who were testing themselves out in the multi-sport event for the first time. If you would like to find out how to get into triathlon read our guide. You can watch coverage of the Triathlon World Series from Abu Dhabi on BBC Two, the Red Button and BBC Sport website this weekend, 5-6 March - find details here.